Reviews of the Nikon 1 V3 from around the web. 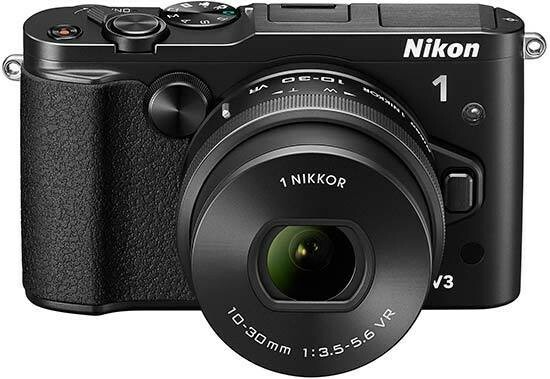 The Nikon 1 V3 replaces the Nikon 1 V2 and is the premium mirrorless camera in the Nikon 1 series, the new Nikon 1 V3 no longer features a built-in electronic viewfinder, but comes with an accessory port on top that supports an optional electronic viewfinder. The camera has a new 18.4 megapixel CX (1inch, 13.2x8.8mm) CMOS sensor, shoot at up to 20fps with continuous AF, or snap 40 RAW images at up to 60fps with focus fixed at the first frame. The Nikon 1 V3 is available as a kit with a VR 10-30mm f/3.5-5.6 PD-Zoom for £799.99, and with the same lens plus an EVF and grip for £1049.99. Nikon's advanced offering from its system camera range hasn't really hit the mark. The V1 didn't offer the level of control expected of an enthusiast camera, and while the V2 addressed some of these issues, it was far from perfect. The question is, then, is it third time lucky for Nikon with the V3?